I have the Apple iPad mini 4 that I use as the display while flying the Mavic Pro. Today I put the SD card from the Mavic Pro into the Apple SD card reader for my iPad mini 4. The iPad Photos app recognized the 4K video as content that it could import, and it did the import when I selected the 4K video. The iPad Photos app would not play the 4K video, saying it did not recognize the video format. I downloaded the DG Player from the iPad App Store and it played the 4K video perfectly for me on my iPad mini 4. Can iPhone or iPad handle 4K resolution video? At present, you can play 4K resolution video on iPhone 5SE, iPhone 6S/6S Plus, iPhone 7 and iPhone 7 Plus. For those people who try to view compatible 4K video with the previous version of iPhone such as iPhone 5/5S/4/4S or iPad Mini 3/2, iPad 4/3/2 or iPad Air, your iPhone or iPad will automatically down conversion 4K to 1080p. The down conversion main depends on which the video player you are using on your iPhone or iPad, different play will generate with different results. If the player you use to play 4K video on iPad or iPhone models that lack the ability to downscale 4K video to 1080p with good quality, it would be much ideal for you to directly view 1080p or compress 4K to 1080p for smooth viewing experience with those non 4K-capable iPhone/iPad models. What 4K file types supported by iPhone/iPad? From above listed information, we can see that although the 4K video recorded with DJI Mavic Pro are using with iPhone/iPad compatible H.264 codec and MOV container file format, however, you will encounter other playback issue due to the unsupported frame rate, bit rate, sample rate, channels issues, etc. If you are looking for a all in one solution to fix the problem of Mavic Pro 4K video playback issue on all iPhone/iPad models, we highly recommend Pavtube Video Converter for Mac (review), the program not only assist you to convert DJI Mavic Pro 4K video to iPhone 5SE/6S/6S Plus/7/7 Plus and iPad Pro/Air 2/Mini 4 supported 4K MP4 or MOV video with compatible H.264 High Profile video audio, AAC audio codec, 30 fps video bit rate, 160 audio bit rate, 48kHz audio sample rate, but also helps to compress 4K to 1080p or 720p if you are using the previous iPhone 5/5S/4/4S or iPad Mini 3/2, iPad 4/3/2 or iPad Air, etc models. If the 4K video recorded with Mavic Pro uses an aspect ratio of 16:9 which doesn’t match the display screen of your iPhone or iPad models, there will be black bars around the video when viewing on those devices, you can easily fix this problem with the program’s built-in crop function to change output video aspect ratio to let them fit with your iPad or iPhone display screen aspect ratio. 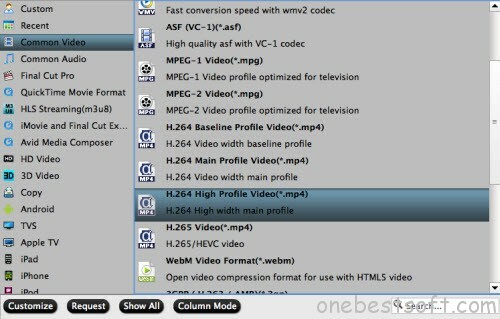 Pavtube Video Converter for Mac is is very easy to use, no matter experienced user or fresh could handle it very well. In addition, it has perfect compatibility with the new Mac operation system – macOS Sierra 10.12. You can safely download and install it on your computer since it won’t trick you into installing adware or spyware. What’s more, the results are high quality, you can’t tell the difference between the converted video and the original 4K video. How to Convert and Compress DJI Mavic Pro 4K Video for Playing on All iPhone/iPad Models? Step 1: Load Mavic Pro 4K video into the program. Start the program on your computer, on the main interface, click “File” > “Add Video/Audio” or “Add from Folder” to load Mavic Pro 4K video into the program. You can also directly drag the files to the program’s main panel. 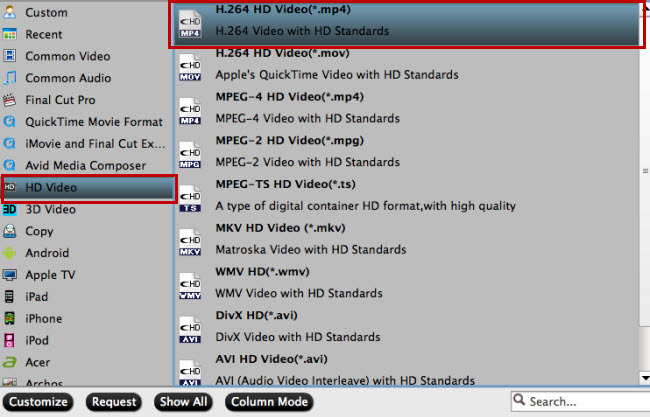 If you are using the previous iPhone/iPad model, it would be much ideal for you to compress 4K video to 1080p by output iPhone/iPad playable 1080p file formats by following “H.264 HD Video(*.mp4)” under “HD Video” main category, make sure to change the output file resolution as “1920*1080″ or “1080*720″ in the program’s “profile settings” window. If you try to play Mavic Pro 4K video on iPhone 5SE/6S/6S Plus/7/Plus or iPad Pro/Air 2/Mini 4, then you can use the program to output those iPhone/iPad models playable 4K video from “Common Video” > “H.264 High Profile Video(*.mp4)”. Then, click “Settings” on the main interface to adjust output profile settings to make them fit with your iPad, you can set the output video codec as “h264″, audio codec as “aac”, video frame rate as “30fps”, audio sample rate as 48000hz, audio bit rate as 160000bps to make them fit with iPhone/iPad 4K settings. If you choose to output to stereo audio or Dolby Audio, please set audio samplebit rate as 1008000bps and sample rate as 48000Hz. Step 3: Change output 4K video apsect ratio. Go the “Crop” tab in the “Video Editor” Window, switch to the “Advanced Mode”. To change output video aspect ratio, there are several aspect ratios for you to choose from, including 16:10, 16:9, 5:4, 4:3, 3:2, and 2:1, you can choose iPad accepted aspect ratio. Once you select a “Display aspect ratio”, the “green crop frame” will keep this ratio to crop video and you are able to preview the final effect in real time. If you want to keep the same aspect ratio in your final output files, do remember to set the Video “Size (pix)” in “Settings” section as the same ratio as display aspect ratio. After all setting is completed, hit right-bottom “Convert” button to begin the conversion from Mavic Pro 4K video to iPhone/iPad series supported file formats and settings conversion process. When the conversion is completed, feel free to sync files from iTunes to iPhone/iPad in all models for conveniently watching on the move. How to Compress DJI Phantom 4 Pro+ 4K to 1080p with No Quality Loss? Can I Play 4K on Xbox One S? Play 4K Video on Sony Bravia 4K TV via USB or DLNA?